So when I was a kid, we’d have this brisket for just about any and all holidays (except Thanksgiving – that was turkey day). I remember the incredible smells of the pot bubbling away on the stovetop, the old blackened dutch oven doing what it was born to do. 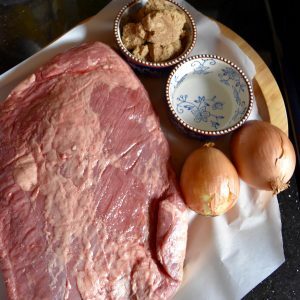 Served most often with buttered noodles or mashed potatoes, this brisket was the Real Deal. Fast forward to me getting my own place, and wanting to impress friends and family, I asked my mom for the recipe. She was cagey at first, but I got it out of her, and was shocked (SHOCKED!) to find the first ingredient on her list to be a can of Campbell’s tomato soup. “But Mom!” I said, incredulously. 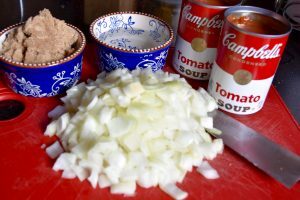 “The sauce came from a can?” She said “It sure did!” So it turns out that this favorite family recipe, handed down from generation to generation, was actually born from a recipe on the back of a Campbell’s soup can. Still…enjoy this incredible brisket, honored with my very first post to this site. I hope it makes it onto your table for special days (and some just regular old ones). Feel free to tinker, as we have, to suit your preferred sweetness level. We normally double the sauce makings because it’s so good! Brisket is always better on the second day, and your patience will be rewarded. 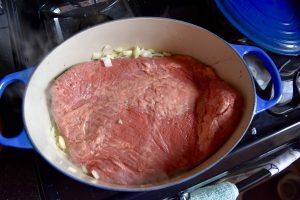 In a large dutch oven, add olive oil and onions. Salt/pepper the brisket, and add to the pot. Brown together for approximately 7-10 mins on all sides. Add the soup, brown sugar, and vinegar, and mix together, ensuring the brisket is coated fully. Bring to a boil on the stovetop, and reduce to a simmer. 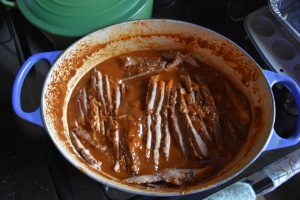 Cover, turning/stirring occasionally, until the brisket is completely cooked (3-3 1/2 hours). Remove from heat and let cool. At this point you could slice and serve, sure, but why wouldn’t you wait a day for the flavors to develop and soak into the tender meat? Place the entire dutch oven in the fridge. Make room. It’s worth it. 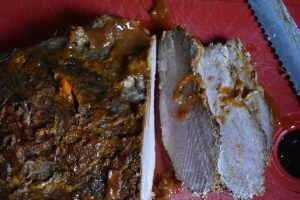 Overnight, it will congeal, and when you take it out the next day, it’ll look gross with an orange fat layer across the top. Skim it off as best you can. Once you’re done, take the cold meat and place it on a cutting board, and with a slicing knife, slice against the grain. Pieces should be approximately 1/3 – 1/2″ wide. 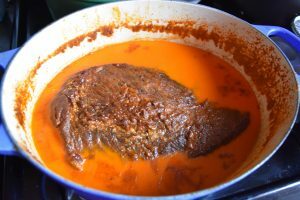 After the whole brisket is cut up, place back into the sauce, and either heat up on the stovetop over medium heat, or place in a 350 degree oven for approximately 30-40 minutes until bubbling. Serve with warm egg noodles (buttered if you’re not Kosher), and maybe nice glazed carrots or roasted brussels sprouts for a dinner that was easily made ahead a day or two. Let me know how you liked it!